If you read the tech press, everyone knows they need an API but most aren’t really sure what it is. They treat it as another checkbox like “Web 2.0” was a few years ago or a mobile app was most recently. In fact, there’s an entire “API-first” movement in development circles that most people don’t understand or even realize why. In this book, we’ll start by discussing the what an API is, why you might need one, and follow up with the how to build one. Unfortunately, your code base is a mess. It has been architected over several years by multiple different lead developers and it shows. There’ are no consistent patterns or structure. The oldest core of the system is a collection of include files running several levels deep. More recently, someone bolted on some class-oriented libraries, and most recently someone decided to try a framework rewrite. All of it was done in different coding styles, with different naming conventions. The codebase is full of files that contain a mixed-up aggregation of PHP, HTML, SQL, JS, and CSS. And the “tests,” such as they were, consisted of the QA team running over the site once or twice a week and filing bug reports. But what if I told you it didn’t have to be this way? What if I told you there was a specific series of small, incremental changes you could apply steadily over time to make your PHP code better, more modern, and ready for an API layer to make integrations easier. Wouldn’t you like to have a plan like that written down for you, distilled into an easy-to-follow list of instructions? 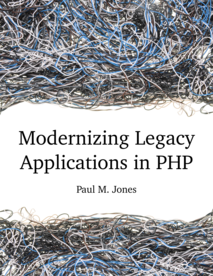 Check out our new bundle “Modernizing Legacy PHP Apps with APIs” to learn how to prepare your application for an API and then design it properly.